Released: 1995. Genre: Racing; Car Combat. 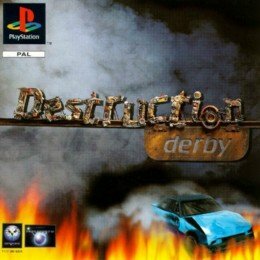 Released during a time when games were still allowed names of a self-explanatory nature, Destruction Derby feels unremarkable and dated next to early PlayStation pacesetters Ridge Racer and WipEout which, along with its superior sequel, went some way to consigning this crash ‘em up to the footnotes of gaming history. It was probably for the best though, as the original DD was very much a work in progress. Reflections’ (who would later develop Driver) early attempt at a stock car crash-fest didn’t quite get the balance right, and though its damage physics are worthy of merit, it never really came together as a racer or a smasher. The player can enter into three different championship disciplines; one tailored to racing (Stock Car), another to crashing (Destruction Derby) and a third which is a mixture of the two (Wreckin’ Racing). Whilst all three present a challenging, structured long-term campaign spanning five leagues and each offers some degree of fun, they’re all severely hampered, either by technical or design issues. The Stock Car racing shows the game at its uncomplicated best, where you are tasked simply with finishing in as high a position as possible. A 20-strong field of competitors is an impressive feat, particularly for an early PlayStation title, as is a consistently good frame-rate, even if the speed of the action itself is fairly modest. Races remain a challenge even when leading out front, as the player is frequently tasked with navigating troublesome backmarkers or nightmarish cross-roads. In terms of pure race-craft, DD has pretty solid handling, though the manner in which the camera waits until you’ve rounded a corner before following the back of the car can be a little off-putting. The racing is let down by some rather unimaginative tracks, none of which offer any particularly memorable sections and instead consist chiefly of straights that are slightly too short and a catalogue of samey 90 degree corners. Its visuals are workman-like at best; cars are robust enough but signs and barriers look blocky, the draw-distance is iffy and there are some decidedly porridgy scenic textures. Despite the occasional night-time variant, the tracks feel very sparse. Wreckin’ Racing, where rewards are meted out for both race position and crashes, should in theory have offered up the definitive DD experience. However, the scoring system is poor, placing far too great an emphasis on the crash element. Severity, viciousness and being responsible for pile-ups will rarely see you rewarded; in fact, pretty much the only way to make an impact on the scoreboard is to force an opponent into a spin. Ranging from two points for 90 degrees to ten for a full 360, plenty of points are up for grabs, meaning the measly ten you get for surviving and winning a race becomes irrelevant. Unfortunately, cars are so brittle that it simply isn’t possible to employ aggressive tactics and still expect to reach the finish – you pretty much have to plump for one or the other. The problem is, forcing opponents into spins proves harder than it ought to be. Many of them hug the barriers of the absurdly narrow tracks, rendering the task nearly impossible. The best bet is to tag them on entry to a corner, but even this proves hit and miss, as you’re about as likely to lose control as they are. And as your car routinely ends up pointing back down the track, the barriers make it unnecessarily troublesome to get facing the right way again. And this leaves Destruction Derby, the most disappointing mode of all because, on paper at least, it should have been the most fun. Indeed, as the name suggests, it was likely the game’s intended selling point. Quite simply, it’s twenty cars, in a big bowl, smashing the living daylights out of each other. It’s a marvellous showcase for the carnage and damage engine, as radiators rupture, bodywork crumples and suspensions buckle, leaving you weaving around all over everywhere. Once again though, spins are where the points lie and it’s tough to get ‘em, as opponents seem to circle the bowl so that by the time you’re facing the middle with a run up, they’ve already flanked you, meaning that despite the large number of targets, it can feel like you’re chasing shadows. Destruction Derby hinted at the fun that could be had with burgeoning technology and the wonders of racing in 3D. Sadly, ‘hinted at’ is as far as it goes. The emergence of the likes of TOCA: Touring Cars would soon date DD’s only partly-realised damage engine, whilst the racing itself was already a long way off the blistering pace Ridge Racer was already setting. With a bit more thought, it could have been top-class. But that’s what sequels are for, right?